With times as they are, I find myself reflecting on gun violence, more than I would like. Recently, I was reflecting on gun ownership through my “Spacework” lens. After all, an aspect of my work involves the psychology of our possessions—what our stuff represents, how it serves us, and why we are attached to it. 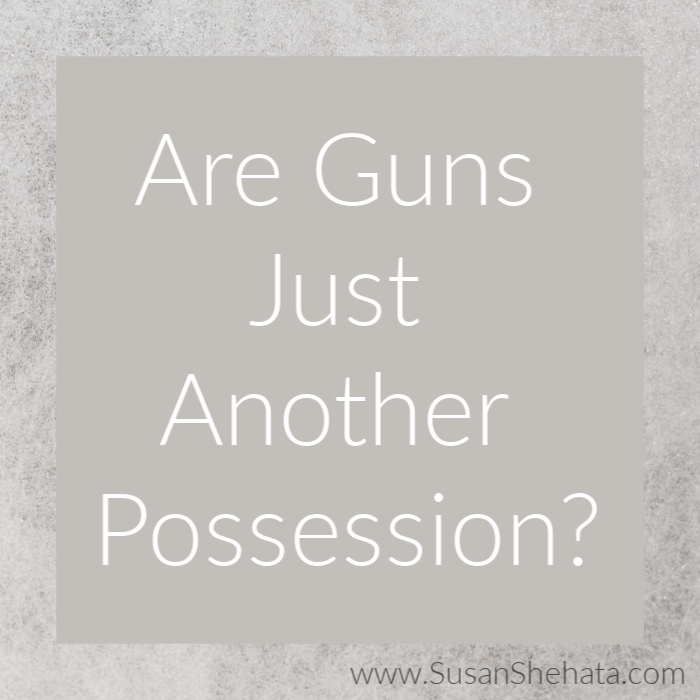 And, when it comes down to it, a gun is a possession. And, we as a culture, have grown VERY attached to our possessions. Hell, half the time, I can’t even convince someone to get rid of their extra toaster. We don’t acquire or keep objects simply because of their function. We keep things because of what they represent to us. These objects become an aspect of our identity. For many people, guns represent safety, security, freedom, power, or something else, altogether. Some people use their guns for sport. But, many people do not actively use their guns. They have them “just in case”—sorta like that extra toaster. When I ask a client to reflect on why they keep that toaster, what I am really asking them is to examine their underlying needs (“If this one breaks, I will need another, but might not have the resources to replace it, so I better keep this other one.”) Once they identify those reasons, they can make a more conscious choice about keeping or releasing the toaster. Likewise, as a society, if we identify the underlying needs of people who choose to own guns, without judgment, and, more importantly, create effective support for some of those needs to be otherwise met, we may be *slightly* closer to helping people acknowledge that the guns are not what they need to feel safe, secure, free and powerful. A gun doesn’t meet those needs. It will only provide the illusion that those needs are met. For some people, that illusion is enough. Which is to say, that I acknowledge that some people will always want to own guns—no matter what. Trust me, I also love the illusion of safety or freedom, etc. But, I am all too aware of how fleeting these things can be, when we look for something outside of ourselves to meet those needs. The sooner that we implement solutions to support human beings, from birth, the less violence we will see in our world. It’s inevitable. Unmet needs lead to fear. And any Star Wars fan knows what comes after that. Until then, people will want to keep their guns…and their extra toasters. I don’t make this comparison to be flippant. I make it because, underneath it all, the psychology of attachment isn’t that different. And the sooner we see that, the closer we might be to a solution.